1951 Eric had just changed jobs from the Civil Service to Shell Oil. His starting salary was £34 a month. It was considered an exceptionally good pay at the time. Despite the aftermath of the Bedenham explosion and the upheaval of the move, there are many warm memories of this period. 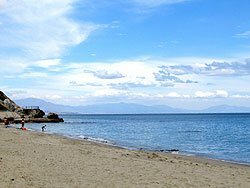 The daily trips to the beach during the summer continued as usual although there were one or two changes. Eastern Beach being the nearest to town had now become extremely popular and was often uncomfortably overcrowded. Baba and her friends broke with tradition and took to going to Sandy Bay. They took me with them. 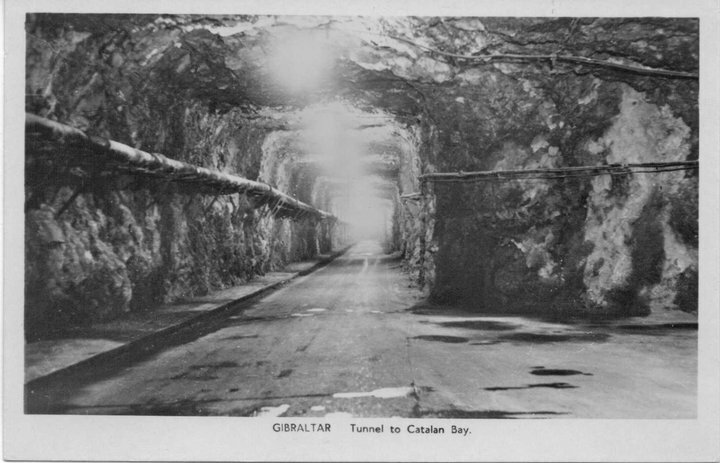 In those days, because of the effects of a landslide, motor vehicles could only get to the other side of the Rock by travelling through a longish and rather crudely constructed tunnel called Williams Way. The bus only went as far as Catalan Bay, so the rest of the journey had to be made on foot. On a hot summers day this only increased the pleasure on arrival, as we all hastily changed into our bathing costumes and dived gratefully into an inviting sea. 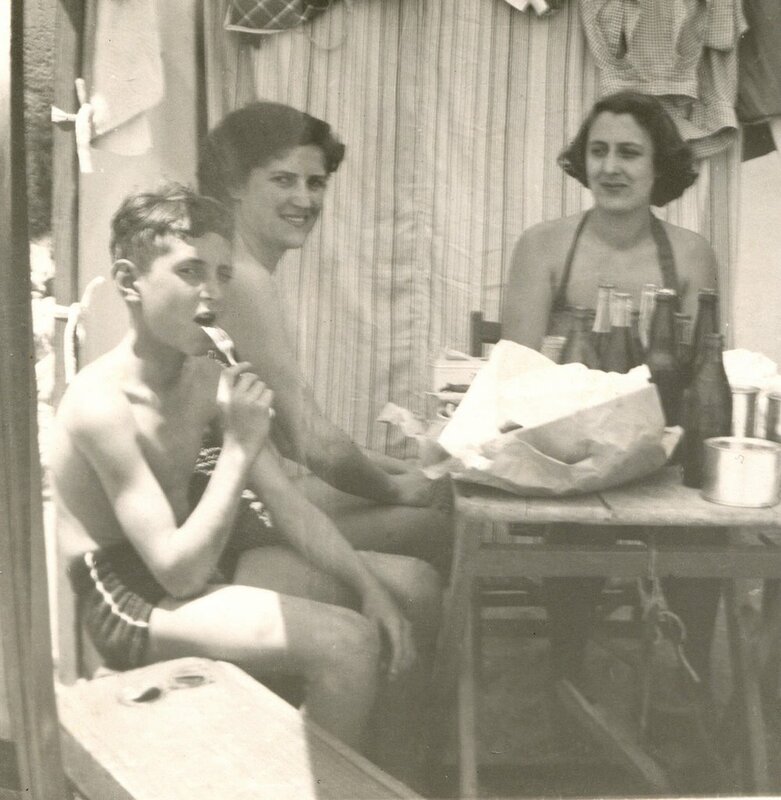 The beach was always almost deserted but invariably Baba and company would choose to settle on the furthermost side. Then, as the sun disappeared behind the tall cliffs above the catchments area, everybody would shift slowly downwards following the sun. Sandy Bay was a misnomer. It had very little sand and was made up mostly of pebbles and boulders. On the sunnier end there was further evidence of the effects of earlier landslides making it a magical place of endless cliffs, small caves, huge rocks and tiny bays. One of these was called Black Strap Cove. It was a perfect place for harvesting mussels, which were known locally as morsillones. Sometimes when the tide was just right, we also collected the much rarer goose barnacle or percebe, which grew on dangerous overhangs on the many rocky outcrops. Tito Torres, who often accompanied me on these expeditions, also enjoyed prising limpets off rocks with a sharp knife and eating the poor molluscs alive. He was also an expert at finding and catching bare handed the occasional small octopus. As we hopped about among the rocks, we would often be distracted by the unmistakeable sound of people shouting at each other many miles out at sea. They were the voices of Spanish fishermen reeling in the long nets of the almadraba. 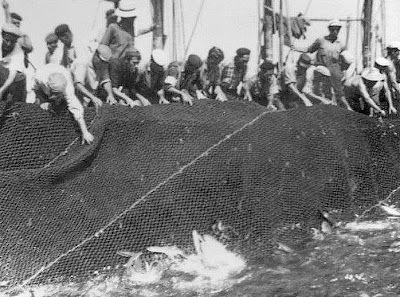 The nets were strategically stretched across the path of Long-finned Tuna and Frigate Mackerel, easily catching the fish as they travelled down the coast of Spain during the summer months. 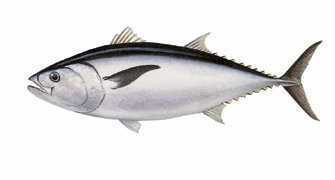 The fish were known to the locals as albacoras and melvas respectively, but the prize catch was el Atun or Blue-Fin Tuna. La Almadraba. The word “Almadraba” is of Arabic origins. 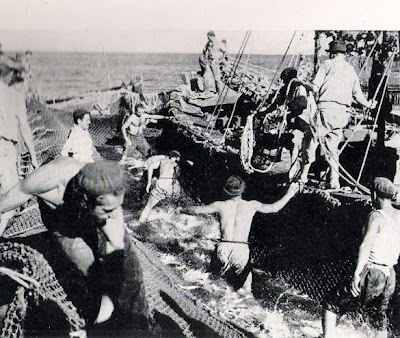 It refers to a system of nets anchored to the sea-bed just off-shore on the tuna’s migration route. This traditional fishing method goes back to Phoenician times and is over 3000 years old. Over two and a half meters in length and often nearly 300 kilograms in weight, it was a miracle of pure swimming power. By far the greatest proportion of the world's catches of this fish were made along the Straits of Gibraltar as a yearly ritual repeated itself and the Tuna abandoned the Atlantic during the month of July and moved into the Mediterranean to breed. It was also a beautiful fish to eat. At the end of the day came the long trek home and the wait for the bus. The children often made the trip less tedious by writing or drawing on the roadside walls. 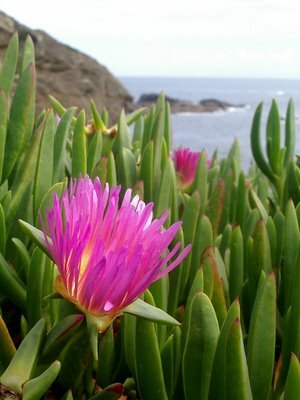 For this we used the thick succulent leaves of the Mesembryanthemum plants that grew profusely on sandy banks close to the road. It was the ideal type of graffiti, as the dark wet marks quickly disappeared as they evaporated under the fierce evening sun. On particularly hot days Baba or one of her friends would suggest a drink at a nearby bar-restaurant called La Terrace. The place was beautiful by any standards. It consisted of a series of terraces full of trees and honeysuckles and its winding staircases and nooks and crannies reached down almost to the level of the waterfront at Catalan Bay. To the younger members of the party, lemonade and crisps would never taste as good again. 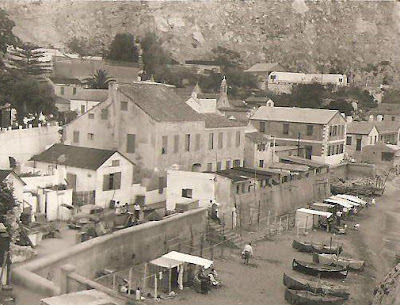 Modern day photo of Catalan Bay. 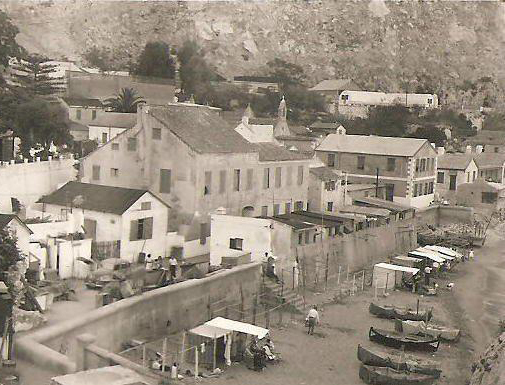 La Terrace occupied the slope behind the new large white hotel at the far end of the town. On very special occasions and for reasons which I was never able to fathom, a decision was taken to go to the beach for the day rather than just the afternoon. It is difficult to explain just why these trips took on such an aura of excitement and adventure. But they did. Nevertheless going to the beach for the day did have its disadvantages. Almost by definition one had to have lunch on the beach. This in itself was always an event to look forward to. Tents were usually erected so that meals could be eaten in the shade and holes were made in the sand near the shore so that bottles could be placed in them to keep the liquids cool. The food itself was invariably delicious and often including such delicacies as tortillas de patatas or even carne empanada, a kind of Spanish Schnitzel. Melons, of both the sugar and water varieties, were a must. Unfortunately there was also an absurd regulation in force at the time that stipulated a wait of at least two hours after a meal before bathing in the sea. The phrase used was ‘para hacer la digestion’. Apparently if one did otherwise one would be overcome by cramp which in turn would lead to drowning. Even paddling was out. It was a maddening imposition to a child on a sweltering summer day. All day at the beach in Sandy Bay. The bottles on the table are most likely to have spent the whole morning in holes dug by the shoreline so they would be nice and cold by lunch time. The girl at the head of the table was a friend of my sister. Her name was Elvira Picardo and at the time was probably the most powerful and elegant swimmer in Gibraltar. Unfortunately she was also exasperatingly slow when on land and often annoyed all of us to the point of distraction by keeping us waiting for ages. As the season wore on, days in which the 'red flag was flying' became more and more common. This was a flag that was hoisted at both ends of the beach whenever the sea was considered to be too rough to swim in. Although it was disappointing to see the thing fluttering in the breeze on arrival, there was always the possibility that it would soon be exchanged for a yellow one, which in turn meant some exquisite swimming and surfing on the frequent and still formidable rollers that would often reduce the beach to less than half its size. 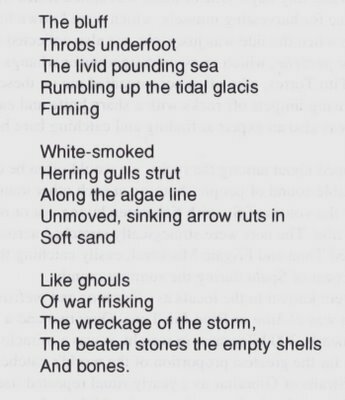 Sometimes, however, when a really heavy levanter took over, the people left early and the beach was taken over by the gulls, sometimes for days on end. 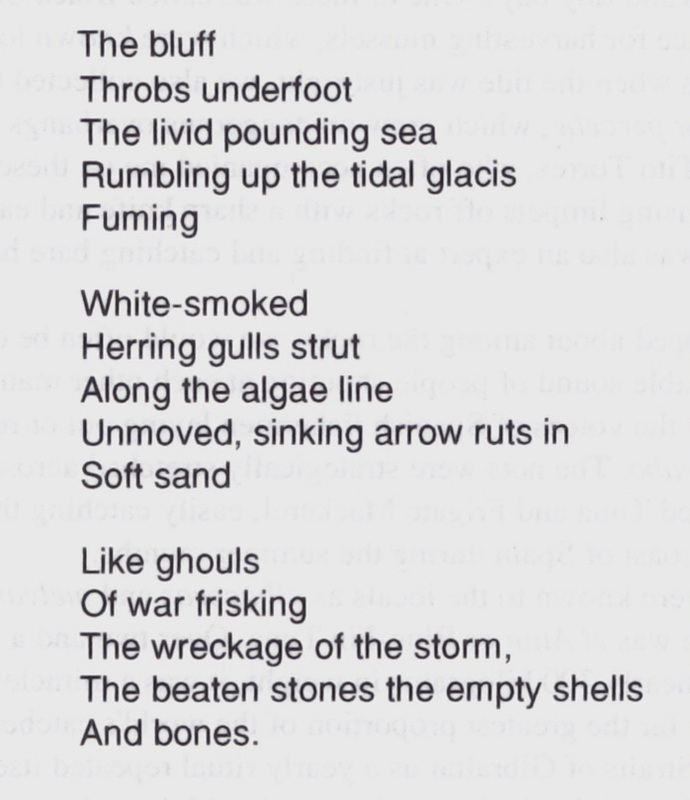 Haiku-type poem written by my brother Eric. The tone captures the atmosphere of Sandy bay in the aftermath of a severe Levante storm. 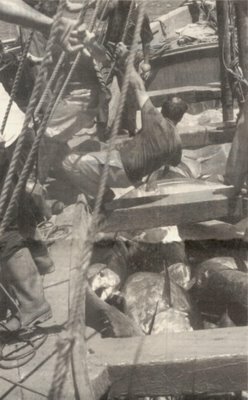 On one or two rare occasions the red flag was raised not because of bad weather but because sharks had been spotted in the vicinity. Although hundreds of pairs of eyes would immediately begin to scan every inch of water, nobody is recorded as ever having seen a shark's fin anywhere near Sandy Bay. There was always a sense of sadness when the daily trips to Sandy Bay ceased and the children knew that the joys of summer were over and it was back to school once more. That autumn term the RAF decided to start what can best be described as a programme of recruitment for the future. In Gibraltar their main ploy was to send a uniformed squadron leader, complete with moustache, to the local boys' schools. There he would give the pupils a short lecture on the joys of being a pilot in the Royal Air Force. He must have been quite a skilful salesman because after the talk everybody in my class decided that they were all going to join the force and become fighter pilots. 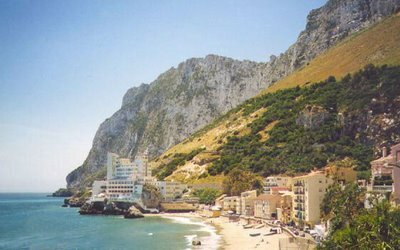 By something of a coincidence, Manecas, Maruja's Madeira friend was in Gibraltar at the time on NATO business and came visiting to 256. By now he was a fully fledged fighter pilot in the Portuguese Air Force. He probably wasn't exactly a thirteen year olds idea of Biggles, but he was definitely charming enough to make an impression, and for a short while I lived in hope that I would one day be invited for a supersonic ride on his fighter plane. Sadly all these romantic illusions were soon shattered when it was discovered that there was something wrong with my left eye. The oculist euphemistically called the condition a 'lazy eye' and immediately forced me to wear a pair of spectacles with a black patch over the right eye, thereby, at least in theory, forcing the 'lazy eye' to do a bit of work on its own. Of course, I cheated both surreptitiously and persistently and the treatment failed. And that was the end of that particular dream. People with my kind of eyesight were simply not eligible to be pilots. Ironically, in middle age, I developed an acute flying phobia which suggests that flying fighter planes for the RAF was always going to be a non-starter. Not long after this visit the navy offered the school the services of an instructor who was qualified to teach the rudiments of Jujitsu. Judo was as yet unknown in Gibraltar. I was one of the lucky pupils selected to take part in learning how to defend myself. On the very first session the instructor chose me as his opponent to demonstrate a particular throw. It was called the 'Baker's roll'. He grabbed me by the front of the shirt, put his foot on my chest and dragged me with him as he toppled backwards. Once on the canvas he kicked upwards with all his strength and hurled me into empty space. I recovered consciousness several minutes later and discovered he had broken my arm. When I returned to the scene of the accident several days later, my arm suitably plastered, the poor instructor was inconsolable. For the rest of the course he spent most of his time trying to make amends by teaching me every trick he knew that made use of only one arm. Unfortunately I have now forgotten every one of those incredible throws. But I do know how to do a 'Baker's roll'.